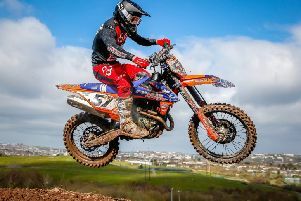 Gary Moulds and Steve Kirwin glad to get track time in England. Early last week the news was confirmed that the Claudy meeting was cancelled due to the relentless rain and it forced both Gary Moulds and Neil Campbell along with their passengers to make emergency arrangements to travel to England for some much needed track time. Gary Moulds and his passenger Steve Kirwin will race a Hocob VMC 665 Husqvarna in the world championship this year becoming the first local team to take on the challenge of a full GP season. “It’s going to be a busy year and to get virtually no pre season track time was a disaster, that’s why we had no choice but to travel across the water to find venues that allowed us to get out and test the new bike,” explained Moulds. “It was the best decision we could have made. Shipley was rough but brilliant and then Wilden Lane was a bit like Desertmartin and the sandy conditions we can expect at Lommel for round one of the championship. Fellow Lisburn rider Neil Campbell finally got some track time on his new bike with new passenger for 2019 Charlie Ide at Wilden Lane, after his regular passenger for many years Craig Parmenter retired at the end of 2018. “We have like many others struggled a bit with the lack of bike time but thankfully we have a few weeks to get some track time in before Lommel and the first GP,” said Neil. “This year we will compete in the British Championship along with a few selected world championship rounds and will be trying to attend as many Ulster championship rounds as we can. 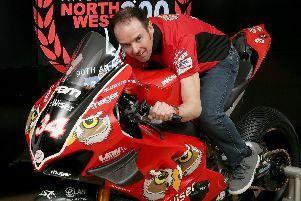 We are looking forward to racing the new bike and can’t wait for the season to get underway,” enthused Neil.